Slacking on the ride reports, eh? Too much to do a blow by blow at this point so let's not live in the past and move up here near the present, shall we? The winter has been pretty mild here lately and for a snow loving fool like myself it has been a bit unsatisfying. Sure, the warm days have been nice (60 degree start on a recent night ride! 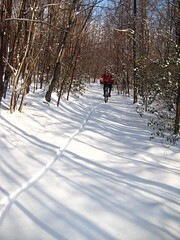 ), but when it dips into the cold temps with nothing white on the ground it's just not as fun as it could be. Friday a few of us were planning on skipping work and heading down to the northern section of the George Washington National Forest for some prime riding. Mid-week those plans looked sketchy, storm rolling in, predictions unsure. Thursday the snow hit and gave us a little winter wonderland. 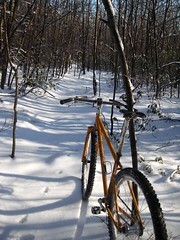 The GW wasn't looking promising with several inches of snow on the ground, too much hiking, not enough biking for the drive down there, so Full Keg and I stayed local and plowed snow at the Watershed. Stuck to some of the lesser climbs, plenty of work breaking trail but the day was beautiful and the trails were fine. 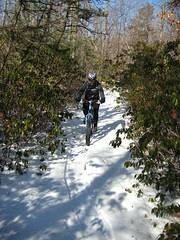 Snow riding is quite sublime when you get the groove going and you can earn a heavy workout in less miles than usual. It was definitely better than a day at work. Flew solo on Saturday, retracing steps from Friday, taking advantage of the trail we cut the day before. We were the only riders to pass through but it still made things easier going. Felt good on the bike, spinning fixed in the snow is the only way to go. Modulate speed with pedal strokes, barely a touch of the front brake except on the steeps. Low pressure in the tires, go with the flow. Wrapped up the day with a double feature, went for a hike in the snow with the lady. Good stuff. Early rise for a trip north to Michaux for more snow, pray at the Dirt Church on Sunday, service starts when the wheels hit the trail. 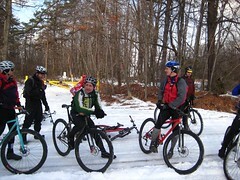 Met up with a bunch of solid riders from all over the PA universe, converging at Big Flats for a birthday ride for Buck. About a dozen riders, 3 of us rocking Tomi Cog fixed set ups, winds howling, 18 degrees F, wind chill made it feel like 0 F. Chilly, but I probably didn't need to tell you that. Breaking trail, fresh tracks were laid all over the place once again. Lots of hard but satisfying work grinding through the snow. Wrap up, wind down, chili and beer post ride, good stuff and good company. Arrive home right when my girl is coming back from her own snow ride, good timing. Fill the belly with more food and beer for post-ride recovery. It's day four of the snow covered trails; gets a slow, lazy start with coffee, a little photo organizing to keep on top of things. Out on the trails mid-day with Mrs. Outlaw, a few more tracks out there, easier going but still work. Warmer than yesterday, a bit less wind but still well below freezing. Fun stuff, blues skies, surfing the snow on the downhills. Four days of snow riding, good, but can I grab another one or two? Not sure, but maybe I'll get lucky.